Covering over hundreds of U.S. banking vertical solutions and over 11,000 financial institutions, FinTech Market reports provide decisioning context where it was previously non-existent. 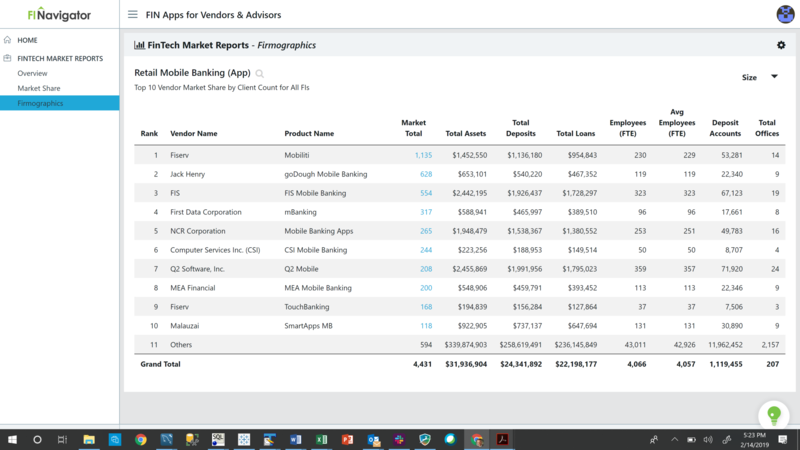 For any given solution, quickly rank all vendors’ market share, filter the results, and even zoom in to view a specific vendor’s client base. Through firmograhics, view the unique characteristics of each vendor’s client base by institution type, size, performance or other factors. FI Navigator’s unique data can enhance your company’s client, product and market strategy development. Whether your focus is FI segmentation, white space assessment, merger & acquisition or other strategic initiatives; FI Navigator can supply you the data foundation to drive transformation. Quickly assess market share rank by vendor or vendor-product combos. Change the basis of share from FI count to deposit accounts. Then filter the rankings by FI type, size, or other variables to produce strategic insight or marketing ammo. You can click any vendor’s client count to see a list of their current clients. The Market Share reports cover many retail, business, and operating solutions ranging from online account opening to core processing. Covering over 100 U.S. banking vertical solutions and over 11,000 financial institutions, FinTech Market reports provide decisioning context where it was previously non-existent. Who is your real competition? Other vendors offering your financial technology may not actually be your true competition – if they tend to attract a different FI segment. 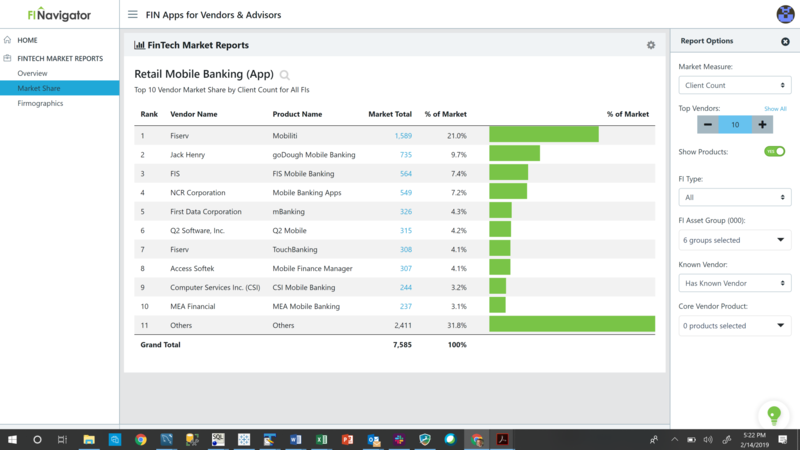 Our Firmographics reports allows you to quickly identify each vendor’s client composition. Sort by financial institution type size, geography, strategic focus, or your preferred segmentation variables. You can click any vendor’s client count to see a list of their current clients. Client segmentation can allow greater efficiency and customization of your sales and account management models. Your FI segmentation model can integrate traditional firmographics with purchase behavior (technographics) and performance characteristics (performographics). Leveraging an effective segmentation model can translate into significant higher conversion and renewal rates – with less expenditure. The larger your client base the more important it is to create resource allocation efficiency through client segmentation. FinTech organizations developing strategy in areas ranging from M&A, product development, account planning or investor communication can benefit from our data breadth and depth. Let us know about your project.